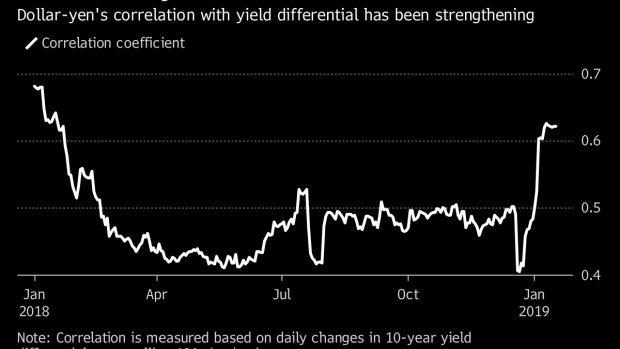 (Bloomberg) -- A strengthening link between the dollar-yen exchange rate and the U.S.-Japan yield differential augurs well for the Asian currency, with a number of strategists predicting it will extend its recent rally. The correlation between the two variables climbed to 0.63 this month, the highest in a year, data compiled by Bloomberg show, as the benchmark 10-year U.S. yield hit a one-year low amid Federal Reserve Chair Jerome Powell’s signal to pause policy tightening. Standard Chartered Plc, Citigroup Inc., Bank of America Merrill Lynch and HSBC Holdings Plc are all expecting a stronger yen in the months ahead. Standard Chartered expects the dollar-yen rate to drop to 105 by the year-end, with the risk skewed toward the downside, Mishra said. That points to a decline of about 4 percent from a level of 109.53 as of 6:15 p.m. in Tokyo on Friday. Japan’s currency outperformed all of its Group-of-10 peers and rallied 3.7 percent against the dollar in the last quarter of 2018. While MSCI’s All Country World Index of equities slumped the most since 2011 over those three months, the Swiss franc -- another traditional haven currency -- ended the period little changed.